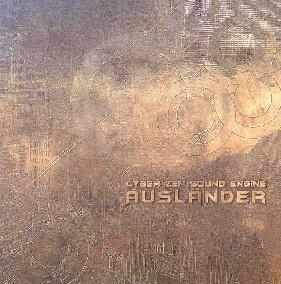 Cyber Zen Sound Engine - "Ausländer"
This is the third CD by this Houston, Texas based group of ambient-electronic music musicians. The bands goal is to stretch the boundaries of ambient electronica by combining elements of ambient, electronica, space and world music in ways these genres are not normally combined. The CD is an hour long journey. The CD begins with the sampled voice of a middle eastern singer followed by a nice groove upon which the backwards sounds reverse themselves over the landscape of sound and slowly take you away. A great piece of work. Called From The Light again begins with a middle eastern vocal and slowly travels upon a great bass line out into space and beyond. Brightly Brightly and with Beauty is a very repetitive guitar drone. Track 6, The Invisible is quite an intense trip of a song. The loop used for the song is a recording of ambience in a jail, with chains, rattling of jail keys, slamming of doors, etc. Quite an impressive track but too short. Life on the Grid would be an awesome track for a sci fi movie. Climbing, Not Ascending moves the CD back into a more tribal music feel but still pretty spaced out. The CD finishes with Shroud (The Final Flag). Some of the music pieces here would be so perfect to become great space ROCK pieces and since I am mainly into rock music, I feel limited in this ambient environment. Overall, I have to say Cyber Zen Sound Engine are truly masters at their art and this CD is some of the best ambient electronica I have ever heard. Highly Highly recommended! For more information you can visit the Cyber Zen Sound Engine web site at: http://www.cyber-zen.com.